You are free to ask your own questions as well. But first please spare a few minutes more and read to the end of this discourse. Then you can release your own repertoire of questions: to me, to yourself and to any other person you deem fit. That’s why we are here: to inspire one another to live a better and happier life. I will begin by holding up my own end; I am going to ask you a few fundamental questions. You don’t owe me any answers. But you do owe it to yourself to sincerely resolve the questions I am putting across in this post. 1. Do you know the purpose of your existence in life? You are not in this world for nothing. Just as everything in life exists for a purpose, you were created for a purpose. The greatest joy in life comes from doing what you were created to do. Your greatest value to humanity is embedded in fulfilling your life’s purpose. Therein also lies your greatest eternal reward. Your reward doesn’t come from running other people’s races, but in running yours. If you want to hear the Master say, “Well done, good and faithful servant,” you must be sure to find out what the Master wants you to do in your lifetime and seek to get it done. 2. Are you satisfied with where you are in life right now? If you are not, are you doing anything to change your position? Remember that popular cliche, “You can achieve anything you set your mind on.” That’s something to think about! No matter where you are or have achieved, there is still room for more. You desire spiritual growth? Work at it. You want a fitter body? Be given to regular physical exercise and mind your diet as well. You feel ignorant in some fields? Take up reading in those areas. You desire to have quality time with your family? Create it. The point here is that, if you are not satisfied with where you are, do something to improve on it. 3. What talent do you have that you haven’t really explored yet? It is generally believed that most people never fully harness all their potentials in their lifetime. But you can be a different statistic. Look at yourself very well and also elicit the opinions of friends and family. You will come up with an idea of any latent talent you have that you can further explore. I have been involved in other professions for most of my working life. Now I am beginning to exploring my writing skills. That was what gave birth to this blog. You would probably not have known that I existed if not for this step. My humble advice would be for you to find out what talent you have that you have not really explored. Begin to use it and be a blessing to the world around you and afar off. 4. Are you regularly doing the same thing in the same way while expecting a different result? That, we are told, is another definition of insanity. I once heard a popular American international televangelist say, “If you always do what you have always done, you will always get what you have always got”. That’s simple, isn’t it? Like they say in elementary computing, “garbage in garbage out.” So if you want a different result, do things differently. You might be surprised at what you will get. Take a different route to the destination you have always visited. At least the different scenery you will see along the new route will be a needed fresh breath. 5. Have you ever considered writing a book? You should be doing that if you haven’t done it by now. One of my greatest desires in life is to write books that will positively impact peoples’ lives. You shouldn’t leave this world without at least one book to your name. When your life passes away your voice will cease. But through your books, you could still be speaking from the grave. If nothing else, the world could use your (auto)biography. There are unique things about your life history and experiences that posterity will learn from. No one can tell your story like you would do. Write a book, tell the world your story. 6. Are you one of those who believe that there is no God? If yes, be aware that you have believed a lie that has an eternal consequence if not remedied. I will be frank with you on this: God exists whether you believe it or not. The earlier you can find out about Him for yourself the better for you both in time and in eternity. Permit me to use this medium to tell you that right now God is calling you into a relationship with Him through His only Son Jesus Christ. Forget about what you were told, dismantle your previous mindset on this and seek God yourself with an open mind. Give Jesus an invitation into your heart and I can assure you He will honor it. Where you touched by any of the above questions? What are the answers you have for any of the questions, or do you feel like asking more questions? Let’s share with one another. INSPIRATIONbook, God, knowing the purpose of life, life, purpose, Questions, questiosn I would like to ask, result, Talent, there is no God? Leaders ask questions. Followers too need to ask the right questions to move ahead. Whoever you are, everyone should develop the habit of asking the right questions. Whatever position or occupation you may find yourself in, there are appropriate questions you should ask to get the clearest pictures of things or about people. The essence of asking questions is to get answers. If you don’t have the answers you need, then you should ask the questions you have. There are some things you may never know or understand, except you ask the right questions. Let me ask you: Are you ashamed or afraid to ask questions? You shouldn’t be! A Chinese proverb I came across reads: He who asks questions remains a fool for five minutes. He who does not ask questions remains a fool forever. There are many things you stand to gain if you will dare to ask the right questions. Assists to clarify your thoughts – Asking questions will help you to clarify your thoughts and those of others too. If someone says something to you and you don’t understand it, it is more honourable to ask questions for more clarifications than to make unsafe assumptions. Helps to elicit interest from your audience – Don’t you know a few people who won’t talk to you until you ask them questions? You can use questions to break the ice! On many occasions, I have used questions to start conversations with people I met for the first time. It works with me! Demonstrates your interest in other people/things – who/what you ask questions about reveals whom/what you are interested in. The questions you ask reveal what matters to you. The questions you don’t ask but you should ask also communicate some things about you. Clears or reduces your doubts – You can sometimes deal with your suspicions and doubts by asking the right questions. If you get the right answers to your questions, they will either dispel or validate your doubts. Improves your knowledge – Naturally, questions can be used in the quest for knowledge. What you don’t know that you should have known is probably what you haven’t asked about. You can ask Google if you are afraid to ask people. Enhances your understanding – If you don’t understand something, ask questions until you grasp it well enough. I used to have a very funny teacher that would tell the class: If you don’t ask any question, that means you understood everything I thought you today. Otherwise, ask now! Enhances your communication skills – communication is not complete until there is an understanding and feedback. Asking relevant questions will help you to achieve better understanding of any subject matter in discourse. Enhances trust – Asking the right questions and getting appropriate responses may promote good communication and friendly communication builds trust. You need trust to build any meaningful relationships. Helps you to solidify relationships – As trust level increases through the good answers you get to your questions, the cord of good relationship toughens. 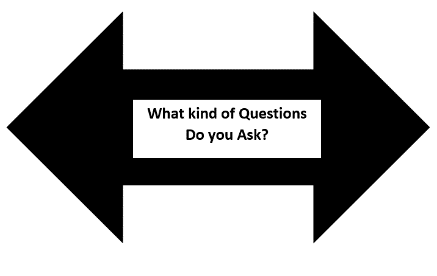 Tool for sifting information – Asking the right questions helps you separate relevant information from irrelevant ones. Not all information you get are useable. You can use questions to separate the grains from the chaff. Promotes better decision making – Good information is the heart of a good decision making process. The answers you get from asking questions will affect the quality of the decisions you make. Saves time and other resources. Have you ever tried to locate something or some place on your own for hours without finding it? And then you decided to ask someone about it and you got immediate help that showed you what you were looking for? Imagine the amount of time you would have saved if you had asked the question ab ni tio! Removes or reduces prejudices – If you ask the right questions and you get the right answers, you will soon get to discover that there is no need to hang on to some previously held misconceptions about some things and especially about some people. Promotes personal confidence – Believe it or not, your ability to ask the right questions is a kind of pointer to your level of confidence. Confident people ask questions. Don’t wait to boost your confidence before you begin to ask questions. Boost your level of confidence by asking questions. Clarifies direction – “He who asks questions never misses his way,” so says an African proverb. If you don’t know where you are going, ask questions to get the needed direction. Enhances your personal effectiveness – Knowing what to do and achieving results thereon could partly be a function of the questions you ask and the answers you get. What you don’t know, ask! Once you know, act! Have you ever gained any benefits from asking questions? Please share your experience in the comment section.